I am so excited to be part of season two of the hit series, Corbin’s Bend. If you haven’t heard, Corbin’s Bend is a fictitious community nesteled in the picturesque mountains of Colorado. The community brings together a specific group of people who share one common interest – the love of spanking. 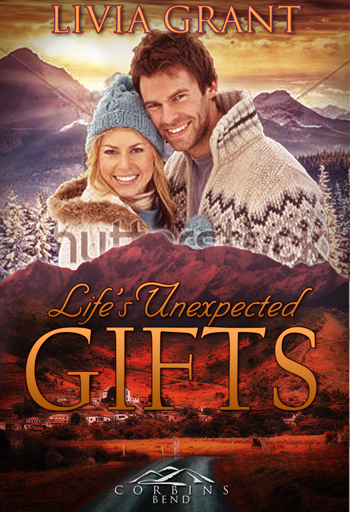 My book will be released on December 17th and is called Life’s Unexpected Gifts. I’ve had my awesome cover for weeks and have been waiting for the day I got to share it. Today’s that day! Ta-da! Meet Hallie and Troy. He’s sure no one notices when he backs out of the space, heading to his sister’s office. Hallie’s waiting just inside the door, her eyes widen when she realizes she’s been caught eavesdropping. She gives him a nervous look and he can see tears pooling, threatening to spill down her cheek. “Oh. Thank goodness.” The relief is short. True terror fills her eyes. Instead of cheering her up, he hears a sob escape instead. Troy is surprised when she hugs him tightly as if he might be her lifeline. He hates to see her in distress, but can’t help but like how she feels in his arms, so warm and feminine. Her head tucks neatly under his chin. Her scent stirs inappropriate feelings under the circumstances. He holds her until she calms. Reaching to the box of tissues on Traci’s desk, he grabs a few and helps wipe at her tears. In spite of their red rims, her green eyes are intoxicating. Her nose is running courtesy of her crying jag. Troy grabs another tissue and holds it out to her. “Here you go. Blow for me.” She blushes, embarrassed, yet she grabs the tissue to comply. “Good girl.” It’s in that second Troy knows how important praise is to Hallie, making him suspect she hasn’t received much of it in her twenty-three years. He watches her relax under his simple compliment. She hesitates before answering softly. “Okay.” It’s not much, but it’s a start. “Or something.” Yep, there’s a story there. She just nods her head, too afraid to speak. This time a slight shake of the head. This entry was posted in Corbin's Bend, Cover Reveal, My Books by Livia Grant. Bookmark the permalink.